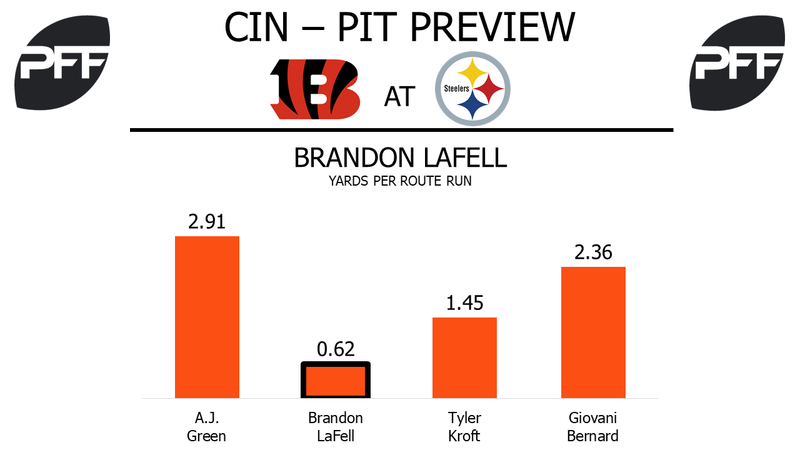 WR Brandon LaFell vs. CB Joe Haden – LaFell has run the most routes of any Bengals skill player this year, but he’s only averaging 0.62 yards per route run, the third-lowest out of 84 qualifying wide receivers. He hasn’t dropped a pass, but he’s only forced one missed tackle after the catch this season. Haden is having a little bit of a bounce-back season with the Steelers, up to a 75.1 overall grade so far. He’s been targeted 20 times on 208 coverage snaps, giving him the ninth-highest target rate among cornerbacks. 14 of those targets have been caught for 186 yards, resulting in a 99.2 passer rating. TE Tyler Kroft vs. LB Ryan Shazier – Kroft is already having a career-best season, and he’s currently the 15th-highest graded tight end at 73.3 overall. He’s found a lot of success out of the slot so far, where he’s run 40.6 percent of his routes. His 1.97 yards per route run from the slot ranks fourth among tight ends, and he has not dropped a pass this season. When Kroft is up against Shazier, he’ll face the most targeted inside linebacker in the NFL this season. Shazier has allowed 25 catches on his 32 targets for 252 yards with no touchdowns and two interceptions. His 73.4 passer rating when targeted ranks as the seventh-lowest among all linebackers, although he has missed five tackles in coverage. G T.J. Johnson vs. DI Stephon Tuitt – The Bengals are still figuring out their right guard position, but Johnson is in line to start once again. He’s allowed one sack, one hit and six hurries on 138 pass-blocking snaps this season, but his bigger issues have come as a run blocker. His 38.7 run-blocking grade ranks 54th out of 73 guards, while his 69.4 pass-blocking grade ranks 38th. Johnson should see a lot of Tuitt in this one, and he’ll have his hands full with the 13th-highest graded defensive lineman in the NFL this season. Tuitt has generated three hits and nine hurries on 90 pass-rushing snaps, to go with six run stops on 57 run-defense snaps. 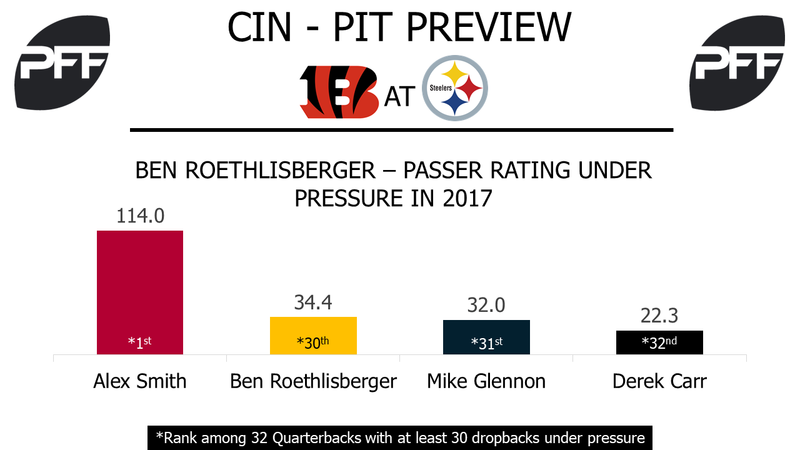 QB Ben Roethlisberger vs. Bengals’ defensive line – Roethlisberger has had a bit of a down year, especially whenever facing pressure. His 34.4 passer rating under pressure is 30th in the league. But this is the first season since 2014 that Roethlisberger’s passer rating is improved when facing the blitz, increasing by 4.8 points when blitzed. The Bengals have gotten pressure when rushing with four or less pass-rushers 42.8 percent of the time. And is the only defense in the league with three players that have 20 or more total pressures this season with Geno Atkins, Carlos Dunlap, and Carl Lawson. Atkins has been the rock for the defense for years and has garnered 24 total pressures lining up over the center, left guard, and right guard this season. Dunlap and Lawson each have lined up over 87 percent of the time outside the tackles. Lawson’s 85.7 pass-rush grade ranks 15th while Atkins’ 86.6 ranks 12th among all positions in the NFL this season. WR Antonio Brown vs. CB Dre Kirkpatrick – Brown is coming off his highest graded game of the season against the Chiefs with a 93.1 overall. It was Brown’s fifth game of the season with 10 or more targets, continuing to prove himself as Roethlisberger’s favorite target. When covered by the opposing team’s top cornerback this season, Brown has reeled in 18 of his 33 targets and 10 of those receptions came against the Browns and Bears. Kirkpatrick on the other hand has faced two top 10 receivers this season, DeAndre Hopkins and Jordy Nelson, with very different results against each. When covering Hopkins, Kirkpatrick held him to only one reception for five yards but gave up a passer rating of 118.8 with two touchdowns covering Nelson. WR JuJu Smith-Schuster vs. CB Darqueze Dennard – Smith-Schuster’s rookie year has seen a gradual increase in playing time as the season has gone on, his offensive snaps increased every week until Week 6 against the Chiefs. Roethlisberger has a passer rating of 106.6 when targeted this season, which is the second-highest rating by any Steelers skill position player this season. Since Week 3, 171 of Smith-Schuster’s 176 receiving yards have come from the slot. He’ll be seeing a lot of Dennard, who spends 70.6 percent of his snaps lined up over the slot receiver. He has allowed 7.5 yards after the catch per reception in the slot, the fifth-most by a cornerback this season.